Posted May 27th, 2010 at 8:01 PM (CST) by Jim Sinclair & filed under General Editorial. What makes something a standard is because there is a restricted supply of it. We have all seen those movies with rooms full of gold. Well this is far from reality. In fact there is very little gold around. Below is a metric tonne of gold. It is only 15 cubic inches. 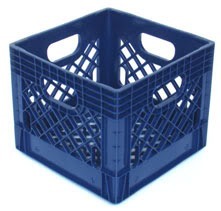 Only slightly larger than a milk crate! 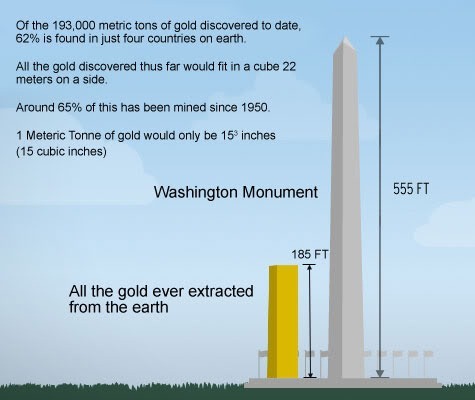 If you collected all the gold ever extracted from the earth and stacked it up in a column with the same base size as the Washington Monument you would get this. ALL THE GOLD IN THE WORLD!!! Gold is traditionally weighed in Troy Ounces (31.1035 grammes). With the density of gold at 19.32 g/cm3, a troy ounce of gold would have a volume of 1.61 cm3. A metric tonne (equals 1,000kg = 32,150.72 troy ounces) of gold would therefore have a volume of 51,762 cm3 (i.e. 1.61 x 32,150.72), which would be equivalent to a cube of side 37.27cm (Approx. 1′ 3”). Gold is measured in Troy ounces and 1 Troy ounce equals 1.0971428571 ounces. A cubic centimetre of gold will weighs 19.3 grams. A cubic meter of gold will weighs 19.3 tonnes. A cubic inch of gold will weighs 315.2 grams = 10.13 troy ounces = 11.06 avoirdupois (ordinary) ounces. A cubic foot of gold will weighs 545.225 kilos = 1188.6 pounds (avoirdupois). At the end of 2001, it is estimated that all the gold ever mined amounts to about 145,000 tonnes. If you took all of the gold in the world and put it in one place how much would there be? It is amazing, but the total amount of gold in the world is a surprisingly small q uantity. Here’s how you can calculate the total amount that is available. If you look at a page like this one, or if you look it up in an encyclopedia, you will find that the annual worldwide production of gold is something like 50 million troy ounces per year. Gold has a specific gravity of 19.3, meaning that it is 19.3 times heavier than water. So gold weighs 19.3 kilograms per liter. 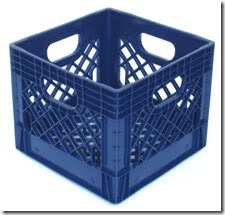 A liter is a cube that measures 10 centimeters (about 4 inches) on a side. There are 32.15 troy ounces in a kilogram. 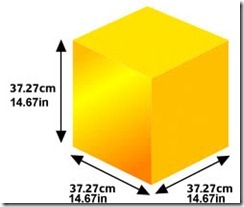 Therefore, the world produces a cube of gold that is about 4.3 meters (about 14 feet) on each side every year. In other words, all of the gold produced worldwide in one year could just about fit in the average person’s living room! This cube weighs 1,555,210 kilograms (3,110,420 pounds). A recent spot price for gold was $256.10 U.S. — using that number, all of the gold produced in a year is worth $12,805,000,000. That’s a lot of money, but not an unimaginable amount. For example, that’s about how much the Pentagon spent launching the GPS satellite system. NASA’s budget in 1998 was $13.6 billion. Figuring out the total amount of gold that has been produced by man is a little harder. To get at some kind of estimate, let’s figure that the world has been producing gold at 50 million ounces a year for 200 years. That number is probably a little high, but when you figure that the Aztecs and the Egyptians produced a fair amount of gold for a long time, it’s probably not too far off. Fifty million ounces * 200 years = 10 billion ounces. 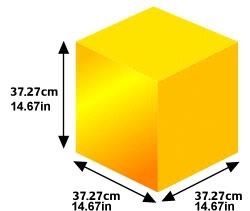 Ten billion ounces of gold would fit into a cube roughly 25 meters (about 82 feet) on a side. Consider that the Washington Monument measures 55 feet by 55 feet at its base and is 555 feet tall (17 x 17 x 170 m). 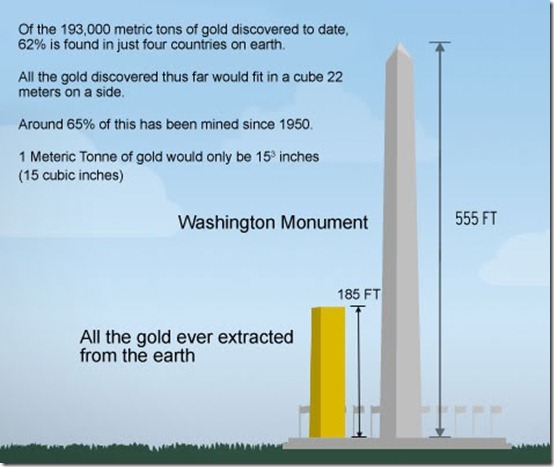 That means that if you could somehow gather every scrap of gold that man has ever mined into one place, you could only build about one-third of the Washington Monument. Page queried in 0.577 seconds.